Let’s call the last several weeks Rehab: Phase 1. During that time, you could have found me at my mother’s bedside while she was in the hospital and a rehab center. Even though the time was full of long hours in a bedside chair or rushed errand trips to and from here and there, I was thankful to be there and to give her the gift of my time, help, and support~all an offering in Christ’s name. It was a well-spent soul rehab for me, and now I realize those life-giving tasks are needed in my own everyday world just as much as in the hospital or rehab facility. Well, that’s Phase 1. Stay tuned for Phase 2 in a day of two. Right now, I’m off to shovel away the snow on the driveway as a surprise for my husband who is at work. And maybe I can share a smile and a hello with someone on a walk, too. What opportunities await you? Let’s take that Colossians 3:12-17 vitamin and go! In the early evening yesterday, snow began to fall. It continued all night. In the light of a nearby streetlight, we could see the snow fall–softly, silently, and steadily. We awoke this morning with five inches of white perfectly covering everything. Every branch of every tree was covered. Bushes assumed a uniform topping. 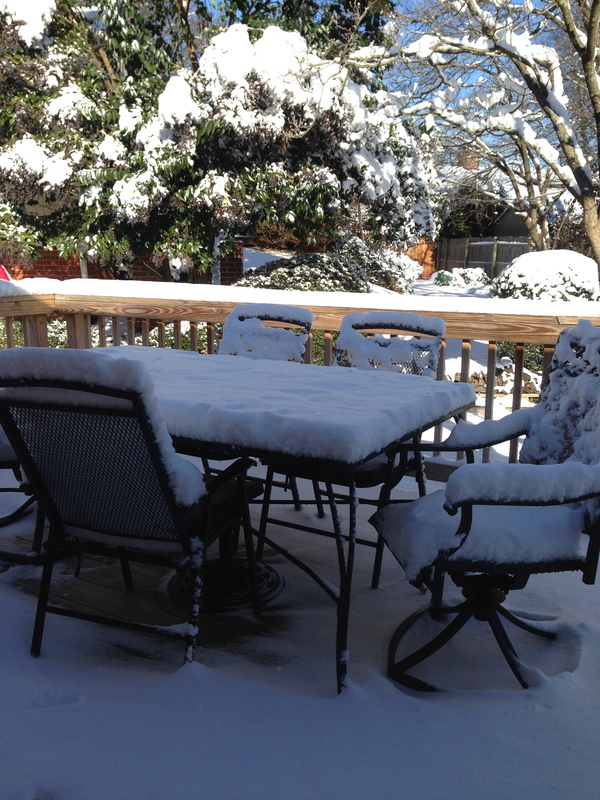 Our deck chairs received a new version of cushions and the table a clean tablecloth. It was beautiful. I went from window to window in our home trying to discover the best photo op (without venturing out until absolutely sure, mind you!) The trees already looked more like the leafless brown creations they really were than the heavenly white sculptures they had been earlier. Every minute counted! The deck and back yard with the bird feeder? The side yard with the boxwood hedge? The line of evergreens across the street? At last I decided on a front view of the house. The sun was coming in at a soft angle and the snow was heavy on the bushes along the front. Already wearing my cozy flannel-lined jeans, a turtleneck and a wool sweater, I grabbed my down jacket and phone, unlocked the front door, and pulled it securely closed behind me. That’s when I realized there was a problem. Happy with the photos, I headed over to the driveway and tried the carport door. As I thought, a responsible Ellen had locked it once inside. Our dog, Teddy, stood at the window looking out at me with confusion, his head cocked to one side. (Sadly, he’s not trained to flip a deadbolt.) The wind picked up and I realized anew that 15 degrees is COLD. Thankfully though, I did have my phone, and I made a quick call to my husband at work. This was a leap of faith as he works in a building that doesn’t receive cell phone signals. Even so, I left a message: “Locked outside. Cold. Please come help.” Short and to the point. Every minute counted–now in a new way! How long would it be until he got to a cell phone area? I didn’t know that, so I needed a contingency plan. Hmm… Where would the wind be least fierce? And then I bumped into it–the car! I’d brought in groceries earlier. Had I remembered to lock it afterwards? I pulled the door handle. It was unlocked! Blessed irresponsibility! I opened the door and settled into my cocoon of wind-free comfort. I moved into the back seat and opened a pair of hand warmers. 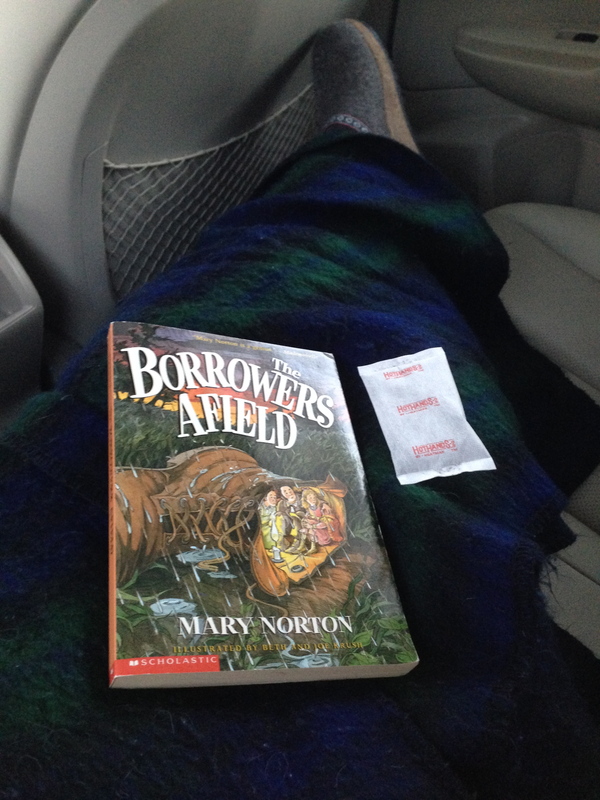 Reaching into the very back, I grabbed a blanket and then a children’s book from a pile I was donating. I stretched out, fluffed the blanket over my legs, held the hand warmers close, and began chapter one. It would be a fun way to pass the time. And do you know what? It really was! And that’s what became my perfect photo op. Yes, the house looks pretty in the snow, but the best moment was in that car. Sometimes plans are rerouted. Sometimes intentions are repurposed. May I remember that. When my schedule of events is altered or takes an unexpected intermission, may I not give in to worry or grumbling. Instead, may I remember Psalm 31:15, “My times are in your hands.” May I remember THIS is the life God has mercifully given me. In THIS moment, Christ is with me. That’s true for you, too, dear friend. Join me, and with a grateful heart let’s thank Him for all our times, for the ones that go smoothly–and for the ones that don’t–all through this new year!